I wanted to share with you all that we are official up and running again! Elizabeth has a new sight now which is why we have been MIA. She has been working with attorney’s and such to get her new place ready and I am pleased she has asked me to stay on!!!! Is that not the cutest image??? It has everyone in it!!!! I can’t wait until I can work it this week! Please make sure you check out the girls project this week!!!! They will always amaze you with their talent! Please also check out http://softpencilstudios.com which is the new site for all your Softpencil needs! I know I want to check it out! Make sure you stop back as I will have my Softpencil and Happileigh Scrappin projects! Another post for this fine Monday! This is our on week at Daisy Doodles and we have a sketch for you to play with! 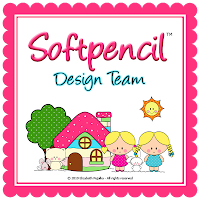 Check back with me since I will have an update on Softpencil Digital Stamps! We are finally going to be back! More on that soon! Thanks for stopping and please leave a comment as I cherish and read each one! It is our free week at Daisy Doodles so that means you are allowed to do whatever as long as you used a Daisy Doodles image! I am so bad at this because I have a had time with being FREE since there is no schedule so I am lazy! This means I am trying to get 2 cards done instead! I can’t seem to have leniency because I procrastinate! Supplies: Freddy, Ribbon: ?,Paper: DCWV, embellies (Cupcakes) No idea, Spellbinders, Stickles, Prismacolor and Gamsol. I used a sketch (kinda) from Cardmaker’s Birthday sketch book changing it up a small bit. I did the bow separate from the other ribbon so that I could put it where I wanted it. I really like how it came out! I also wanted to have a sparkly frosting so I added Stickles to the cupcake and the part Freddy is eating plus the drip! Hope you like it! 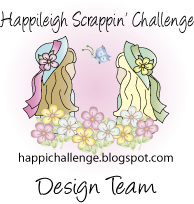 I will be back on Monday with Happileigh Scrappin and Daisy Doodles sketch challenge! I have a great project for this sketch! Make sure you stop back! I am wanting to share a great place to shop for all kinds of crafting items! You will find everything you need to make the perfect project all in one place! Another great thing is that shipping is a standard rate, can you find that other places? I am going to show you a project that I made a while back using the Spellbinders Labels 4 dies available at ABC Toys and Crafts store! Supplies used: Image: Blackleaf Studios, Spellbinders Labels 4, Pearls E, Paper: Stampin Up and Karen Foster, Ribbon: Offray and Joann’s Etc. I hope you will stop and visit the store as well as the challenge blog! Thanks for stopping by! You should be arriving to me from the very talented and creative Theresa! If not it is okay because our hops have no specific direction but you HAVE to visit and leave love for each team member to win a prize because one Design Team Members will be secretly chosen as the "MYSTERY HOSTESS" of the blog hop and one lucky commenter will receive one of our new release images for free or any individual image of their choice. So of course you don’t want to miss anyone! I got to work with Schyler Skis! I had so many great sentiments I thought to use but of course no profanity can be used. LOL So I used a generic friendly word instead! Now if I make it for a certain family member I would use the grown up words! Hee hee! So now that you have visited me and of course left me some love! 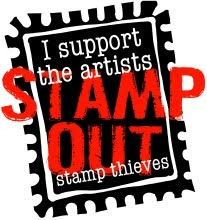 You will be on to the superb creations of Ginny! This is the list of the marvelous blog hoppers that you need to visit and leave love for for a chance to win the grand prize! Thanks for stopping by! See you soon! We also have a new guest designer for March! Hope you will all stop to see Crystal’s work next month! I almost blew it today by revealing my blog hop card thinking it was already next week! I had to get it done because the girls and I are going away for the weekend since James is traveling for work! So I was working ahead of time which is unusual for me, LOL!! I just think he is so stinkin’ cute! I used only the greens in the photo challenge so decided to make his shirt orange! As always my team mates will have great projects to see and would love to have you swing by them and leave them love! 1. Use the images and Dudette creations above to get your mojo moving. 4. Be sure to use the InLinkz below to submit your creation. You have until Tuesday, February 22nd to upload your project using InLinkz below. We'll be announcing the winners right here that evening.